The Percusys® screw-rod-system consists of a small clear instrument set and the implants – the screws and rods. 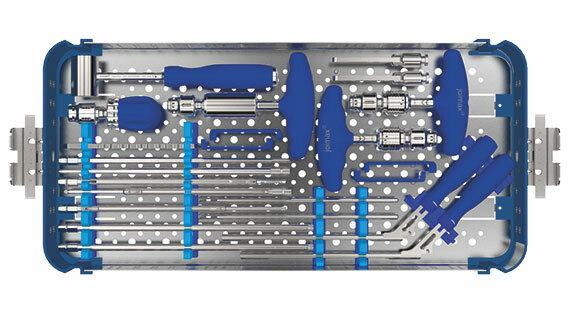 The small and easy to handle instrument set contains all instruments to carry out the surgical steps for spinal stabilization. The slim design of the instruments allow small incisions to reduce muscle or tissue trauma. In addition, the instrument set perfectly matches the EndoLIF® System for the fusion of vertebral bodies. The lengthening shaft contains the preassembled set-screw and serves as a guide for the rod. In practice, most surgical steps are carried out by using the intelligent lengthening shaft: introduction of the rod, reduction, distraction and compression, raising of the vertebral bodies to restore physiological alignment, fixation of the rod and – if necessary – the cement application. The lengthening shaft is connected to the tulip using a snap off technology. It can be severed burr-free. The patented Percusys® screws have all the same outer design with the characteristic lengthening shaft. The screws are available in diameters of 5, 6, 7 and 8 mm and, depending from diameter, lengths from 30 to 55 mm, with screw heads in polyaxial and monoaxial design. All screws are color coded, cannulated, self-drilling and cementable. They are supplied in individual sterile packages. The rods are available in various lengths (30 to 300 mm), with or without prebent lumbar radius. The rod diameter is 5.5 mm. The Percusys® rods consist of a titanium alloy. In many cases the rod can be inserted via the existing incisions using the lengthening shaft for guidance. Once the rods are fixed with the preassembled srews, the rod inserter is decoupled from the rod.